Flex-Ledge seal offers tight shut off with low pressure drop, and can operate in high dust load applications. Many different actuator options to fit customer’s operating requirements. Applications where 100% isolation is not required. Attached or linked to piping/duct flanges or directly to duct. Flange connections may be alignment bolted and seal welded into the duct, or provided with bolt and gasket type connections. Louver dampers typically require between 8”-24” of duct space for installation. 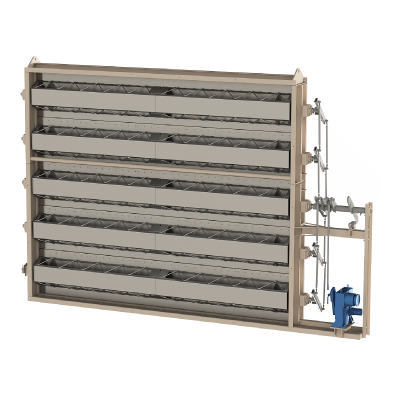 Single louvers are used for duct isolation and flow control.